It may not yet be on the same scale as The Great Escape, Reeperbahn or Eurosonic but Off The Record, a festival and conference is fast making a name for itself as a showcase for innovative ideas, new music and emerging artists. Now in its third year – with both of the previous events having sold out – Off the Record was launched by the people behind three of the UK’s premiere independent music festivals; Kendal Calling, Sound City and Bluedot. It is a multi-venue event that takes place within the Northern Quarter, the old textile sweatshop area of the city centre which has been transformed over the last 20 years into one of the more bohemian quarters of any British city. It is home to the eight venues at which Off the Record performances are held, which include, for the first time, the iconic Band on the Wall, the World Music venue which reopened in 2009 after a £3 million makeover and The Castle, the 242-year old pub which in 1979 hosted the now legendary John Peel interview with Ian Curtis. Other venues include Night & Day, originally a Fish and Chip Shop which has been the location of early performances by innumerable British and foreign artists and bands including Elbow, Kasabian, Jessie J, Arctic Monkeys and Manic Street Preachers. 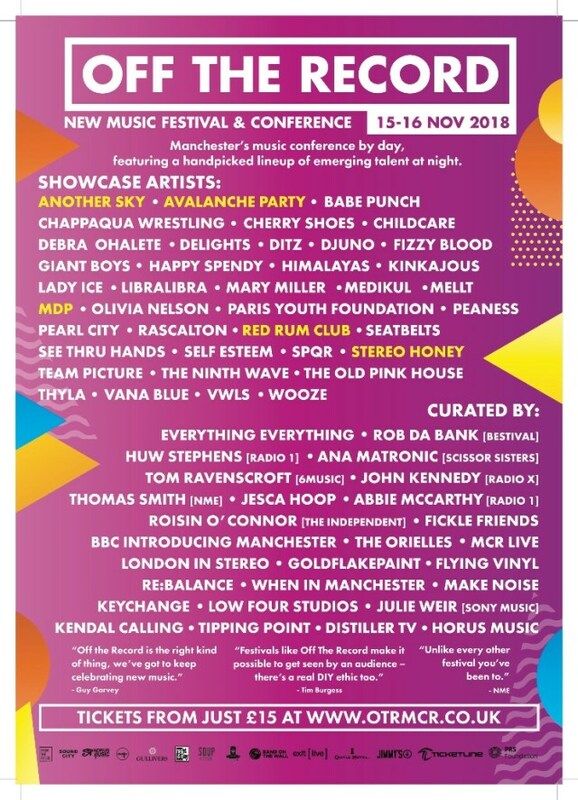 Artists are curated by a Who’s Who of the business, including Manchester’s Everything Everything, who have their stage at the Band on the Wall, the Californian-Manc Jesca Hoop, Halifax’s The Orielles, Radio 1’s Huw Stephens, 6Music’s Tom Ravenscroft, and Radio 2’s Scissor Sister, Ana Matronic. The conference, held in the Methodist Central Hall on Oldham Street (alcohol-free, of course), will include a song writing master class with Doves, and sessions that include: Getting Your Music Heard; Streaming vs. Radio; DIY vs. Indie vs. Major; Northern Revival; The Evolution of Mastering; and Exploring the Relationship between Artist & Manager with Jeremy Pritchard from Everything Everything and his manager Peter McGaughrin from Red Light Management. 6pm – late: Music Showcase at Jimmy’s, Band on the Wall, The Peer Hat, Soup Kitchen, Gullivers, Aatma, Night and Day, The Castle Hotel.